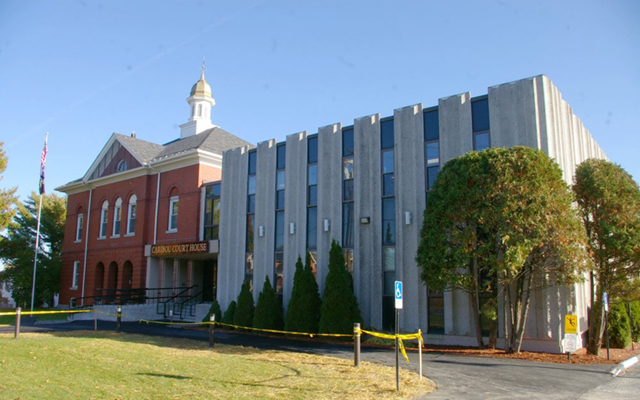 CARIBOU, Maine — The following cases were heard under the Aroostook Criminal Docket at the Caribou Courthouse during the month of November. Micah S. Carton, 31, Houlton: probation violation, seven days in jail, probation continued. Marcus R. Toner, 29, Hodgdon: probation violation, seven days in jail, probation partially revoked. Blaine E. Wilkins, 34, Caribou: probation violation, probation continued, no sentence imposed. Bonnie L. Sarmiento, 58, Washburn: probation violation (two counts), two years in prison, probation revoked. Mark S. Mullen, 34, Blaine: probation violation, six months in jail, probation partially revoked, probation continued. Jeffrey R. Cashman, 39, Van Buren: probation violation, 50 days in jail, probation partially revoked, probation continued. Derek Giggey, 42, Limestone: probation violation, no sentence imposed. Steven V. Shola, 25, Caribou: probation violation, nine months in jail, probation partially revoked, probation continued. Moises Orellana Ortiz, 41, Winter Harbor: unlawful furnishing of scheduled drug, $1,500 fine. Michael Conroy, 27, Blaine: probation violation, 48 hours in jail, probation partially revoked, probation continued. Bryan R. Ouellette, 28, Caribou: operating while license suspended or revoked, prior, $500 fine, 45 days in jail; operating while license suspended or revoked, prior, $500 fine, $500 suspended, 45 days in jail; operating while license suspended or revoked, prior, $500 fine, $500 suspended, 45 days in jail; operating while license suspended or revoked, prior, $500 fine, $500 suspended, 45 days in jail. Cory A. McBreairty, 38, Caribou: operating while license suspended or revoked, $500 fine. Neil C. Gahagan, 35, Fort Fairfield: operating after habitual offender revocation, three priors, dismissed; violating condition of release, dismissed. Bryan R. Ouellette, 28, Woodland: criminal trespass, $500 fine, $500 suspended, 30 days in jail. Carter Doherty, 19, Mars Hill: aggravated trafficking of schedule Z drugs, dismissed. Craig Sowards, 48, Old Town: operating while license suspended or revoked, filed on $50 costs. Jacob Turner, 26, Presque Isle: failure to register vehicle, $150 fine. Chad Caverhill, 24, Caribou: probation violation, 45 days in jail, probation partially revoked, probation continued. Joshua Brian Caldwell, 30, Fort Fairfield: operating while license suspended or revoked, prior, $500 fine, 30 days in jail; motor vehicle speeding: 30-plus mph over speed limit, 10 days in jail. Meagan Ouellette, 26, Caribou: criminal mischief, two days in jail. Bryan R. Ouellette, 28, Woodland: operating while license suspended or revoked, prior, 20 days in jail; violating condition of release, 10 days in jail; operating while license suspended or revoked, prior, 10 days in jail; ATV operator failing to stop and identify to landowner, 10 days in jail; violating condition of release, 10 days in jail. Jason L. Reitmeyer, 38, Patterson, La. : criminal trespass, 10 days in jail; burglary of a motor vehicle, dismissed; theft by unauthorized taking or transfer, dismissed; refusing to submit to arrest or detent, physical force, 10 days in jail. Jesse D. Guyette, 33, Caribou: domestic violence assault, dismissed; disorderly conduct, offensive words, gestures, 19 days in jail. Paul A. Wasson, 27, Presque Isle: theft by unauthorized taking or transfer, 10 days in jail. Chad Caverhill, 24, Caribou: criminal mischief, dismissed. John Pelkey Jr. 67, Limestone: OUI (alcohol), $1000 fine, 10 days in jail, 150-day license suspension. Ricky Ouellette, 58, Frenchville: theft by unauthorized use of property, seven days in jail; OUI (alcohol), one prior, $700 fine, seven days in jail, license suspended three years, registration suspended; operating while license suspended or revoked, dismissed. Julia Deveau, 25, Limestone: permitting unlawful use, $100 fine. Wayne R. Fox, 39, Caribou: failure to register vehicle, $100 fine. Susan Bennett, 63, Fort Kent: motor vehicle speeding: 30-plus mph over speed limit, $500 fine. Jesse D. Guyette, 33, Caribou: violating condition of release, 19 days in jail. Bradley Currie, 45, Standish: unauthorized subpermittee hunting moose, $200 fine. Bayleigh Voisine, 28, Mapleton: violating condition of release, $250 fine, five days in jail. Dale Easler, 61, Washburn: burning without permit, $100 fine. Bryan R. Ouellette, 28, Woodland: operating ATV on public way, $100 fine, $100 suspended; operating ATV on land of another without permission (two counts), $100 fine, $100 suspended; operating ATV on public way, $100 fine, $100 suspended. Elliott JF Garrett, 23, Limestone: operating ATV on public way, $100 fine. John S. King, 40, Washburn: allowing minor to operate ATV in violation, $100 fine.